We all have difficulties when it comes to making the switch from our cozy old garments to something new, especially when we need an injection of style. Here are six simple updates you can make that’ll instantly revitalize your closets without costing you the Earth! So your favorite novelty tee has finally bitten the dust; or rather, you’ve read any article on Guy Style Guide relating to novelty clothes and thrown them all in a large black garbage bag. Replace with a combination of fresh crew-neck t-shirts in a solid colour to complement your complexion. Grab a casual dress shirt too; mixing these into your everyday wardrobe will instantly update your style. Or those full of holes with frayed stitching. 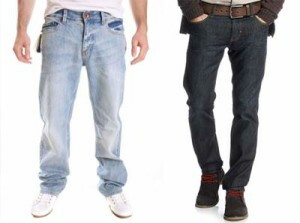 Replace with a rich indigo pair and, unless you have a specific need, in a straight cut style. An instant upgrade in every department. You could also consider a pair of dark chinos with a suitable belt as an alternative; these will assist your transition from ‘80s Rocker’ to ‘Contemporary Casual’ in no time. While team support is fine for match day, it won’t help your overall style quota. Consider ditching for a fine knit pullover in solid navy or grey. Not only will the elegant simplicity match virtually every item in a reasonably stocked wardrobe, it’ll help bring out the right notes in your complexion – unlike that bright orange shirt with white piped lining. Again, these are fine for the squash court, but graying gym socks have no place outside of sports. Find several pairs of argyle-patterned cotton socks and rotate regularly to up your style quota cheaply and effectively. While fine for the mountains and outdoor explorers, rich-toned Harringtons and Bomber jackets easily supersede the best quality fluorescent jackets on all but the rarest of occasions. You can really step up your game with a navy sports coat or blazer if you wish, though you do lose the waterproofing qualities of alternative coveralls.